It’s been a rough era for football fans in the state of Georgia. 11 months after the Atlanta Falcons blew a 28-3 lead in the Super Bowl, Alabama backup quarterback Tua Tagovailoa led the Crimson Tide back from a 20-10 deficit with three minutes left, and delivered a walk-off 41-yard touchdown pass to DeVonta Smith for a 26-23 over victory over Georgia in Monday’s College Football Playoff championship game. What a turnaround for Alabama, who not only trailed in the fourth quarter but also lost on (essentially) the final play of last year’s championship game to Clemson. 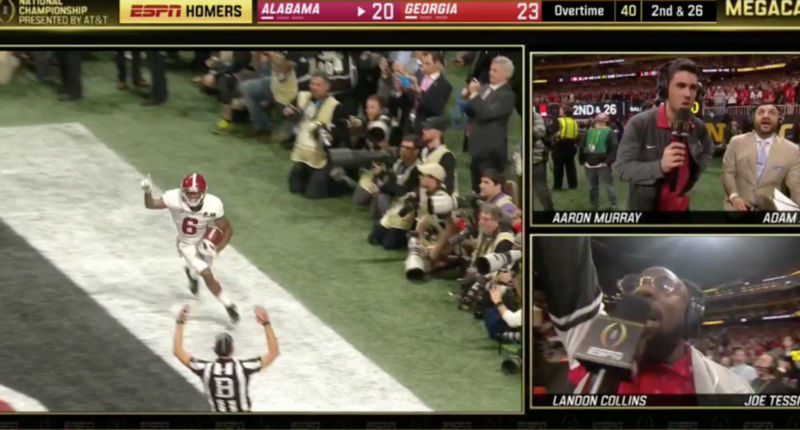 As you can imagine, the incredible finish led to some awesome calls on the various broadcasts. We’ve rounded them all up for you here. Of course, this was all for naught. We all know UCF is the real national champion.